The New Frontiers tour July-August! Download: Cover of Gillian Welch, new MP3 of "Man Down," and live video now! 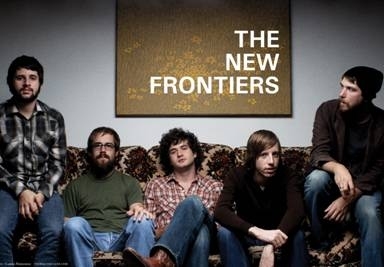 This week The New Frontiers will celebrate their recent signing with High Road Touring (Wilco, Drive By Truckers, Yo La Tengo, Old 97s), by hitting the road on a coast-to-coast national tour in support of Mending, their debut record released earlier this year via The Millitia Group. While the Dallas based quintet has already spent all of 2007 touring alongside some of the country’s hottest buzz bands (Manchester Orchestra, Colour Revolt, and Annuals), and earlier this year with label mate Denison Witmer, this time around the tour will allow them to explore a bigger-louder live sound playing larger venues with The Honorary Title and Paper Rival. Check out the full tour dates below. Earlier this year, the group won critical praise on their debut album from tastemakers such as Under The Radar, Paste, Absolute Punk, All Music, Yahoo! Music, and they recently made Amazon’s “MP3 Downloads Bestsellers”, debuting at #4, where they shared the list with Radiohead, Led Zeppelin, The Magnetic Fields, and the Juno movie soundtrack. The group also had the chance to stop by the Daytrotter studios to record select tracks from Mending and “Car Doors And Stolen Keys,” a previously unreleased gem that would have been on Mending but didn’t get finished until well after the album was completed. Download the rare track here (LINK) and, on the topic or rare gems, listen to their lovely cover of Gillian Welch’s ”Look At Miss Ohio” (MP3). In other news, The New Frontiers also had the chance to visit Indie Rock Reviews’s Bionic Ear studios (LINK) while passing through Southern California on their spring tour earlier this year. As part of their manifesto, Bionic Ear sessions are a great setting for bands to rework a song off of their latest record, strip it down, and show its raw state on analog tape. For a taste of what's to come in the next two months, watch the video IRR recorded of The New Frontiers’s alternate version of “Man Down” (LINK). Indie Rock Reviews says “...it is every bit as good as the album version and has a few surprises for all you fans. The song has more of a raw feel to it which we think captures what The New Frontiers is all about.” Check out the photos from the Bionic Ear session (LINK) and listen to the original studio recording of “Man Down” (MP3), a new MP3 now available for download. Anchored by singer Nathan Pettijohn’s emotive vocal delivery, and complemented in kind by an equally skilled Dallas-based supporting troupe, The New Frontiers present tunes with a quiet sense of majesty that still manage to pack a colossal emotional footprint. Mending contains 11 tracks that combine dashes of alt-country, brit-rock, and indie-pop (among others), akin to Ryan Adams and Wilco, that are sure to win over sets of ears for years to come. From the opening swells of “Black Lungs,” (MP3) Mending grabs a hold of its listener, but not at all in a forceful way. It is the type of prompting that begs for acquiescence, and the rest of the LP only cements that notion. 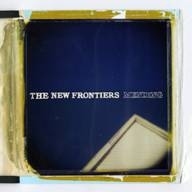 Whether it is in the heartbreaking emotion of “The Day You Fell Apart” (MP3) or the patient reflection of “Man Down” (MP3), The New Frontiers pack an abundance of poignancy into their entrance onto the world’s stage.